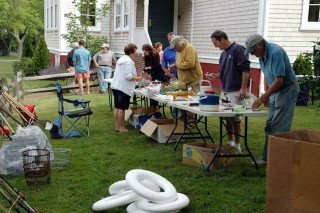 BARS’ Tackle/Chowdah/Miscellaneous Items Yard sale will take place June 21st, 9 – 3 pm at the West Barnstable Community Building, Rt. 149 in West Barnstable. This is one of our major fundraisers and we are in need of gently used tackle and fishing gear, shellfishing gear, and gently used household items for the Tag Sale. If you, or someone you know, would like to donate to our yard sale, it would be greatly appreciated. You are helping out BARS when you donate. You can either bring items to the yard sale before 9:00 AM or contact Ron Glantz via email at roncapecod@comcast.net to make arrangements for pick up. Thank you.